In a few years, you may see scores of giant blimps floating overhead. But it won't be because Goodyear is having a hoedown - those blimps are actually wind turbines. They're not your typical turbine, though. 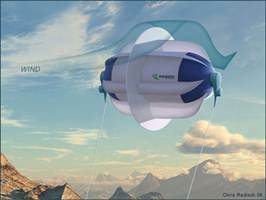 These extremely mobile energy generators, christened with the acronym MARS, will float high in the air at altitudes ranging from 600 to 1,000 feet (183 to 305 meters). 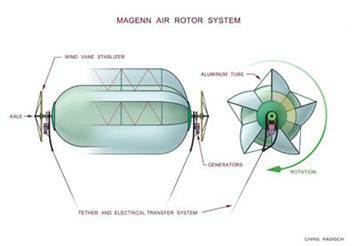 The MARS acronym - not to be confused with the red planet - stands for Magenn Air Rotor System. The turbine's only relationship to outer space is the fact that it slightly resembles an oddly shaped UFO. Why a floating turbine, you ask? Magenn originally designed the turbine for locations where setting up a traditional wind farm isn't realistic: places with a harsh climate like an Antarctic research station or disaster areas that need quick access to power for emergency and medical equipment. But although the inventor of the MARS turbine designed it mainly for remote areas and didn't intend for it to compete with conventional turbines in the current wind turbine market, it's difficult not to compare the two. Although the basic concept behind it is the same as that behind traditional wind turbines - the conversion of one form of energy (wind energy) into another (electricity) - the MARS turbine possesses several differences that could make it appeal to a wider market. One of those differences is that it doesn't rely on a large tower to hold it up. It's simply attached to the ground by a strong tensioning cable called the tether. But the differences don't end there.